We talk a lot about the cost of gasoline these days. With prices pushing to the $4/gallon level it’s white knuckle time as we watch to see how the economy will react — and with good reason. The economic stagnation of the 1970’s was due in part to the rise in fuel prices and the last time gas prices rose to this level (2008), Americans drove less and the economy tanked. It’s true that in the 1970’s we were also working off the excess spending of the 60’s which included lavish spending on the Space Race and on a war we didn’t need that arose over some wise guys’ ideas about dominos. But I digress. Similarly, a couple of years ago there was a debt crisis triggered by an epidemic of bad mortgage lending — which is still with us — that helped bring on the misery. But stay with me fuel prices are a real concern. As prices continue to escalate the people who can least afford high prices — typically the young and economically disadvantaged — will begin to peel off from the car habit and look for a less expensive option that delivers transportation more as a service than as a possession. We already have that with public transit in cities but for the times when you absolutely need a car, the subway won’t do. The cost of a car, even factoring in gas, is far from the whole story. There’s also insurance and parking to consider. If you’re lucky enough to have a late model car, the cost of maintenance might be very manageable and if you live in the ‘burbs parking won’t be much of a bogie. But if you live in a city all of those things add up in a big way. City dwellers, especially those who live in places with good public transit, avoid car ownership if at all possible and it’s the insurance and parking that pile onto the other fees that break the equation. 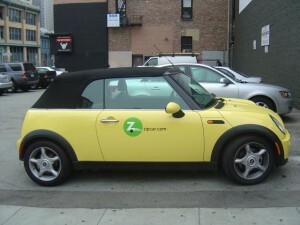 So it was with great optimism that Zipcar, a Cambridge, MA based company, went public last week. The reception has been robust. The company went out at $18 per share and climbed to $28 very quickly. This is another example of the subscription economy at work. It’s doesn’t take any special intellectual capacity to figure out that all the costs associated with owning a car are prohibitive in a city and half a million people have joined Zipcar because they see the company’s “wheels when you want them” promise as a powerful alternative. Buying into to a car service rather than buying a car is part of what many people are referring to as the subscription economy. It started in the software industry when companies like Salesforce.com began selling access to their customer management software rather than selling licenses. Just like the car example, software has many hidden costs beyond the core cost of the software. The term has been popularized by Zuora, a company focused on providing subscription vendors with billing and payment systems that cater to the unique needs of subscription providers. Companies can easily spend multiple times the cost of software on things like computers, networking and integration services to make it all work. A subscription service for software is a neat and clean alternative that provides the customer with a single low cost bill each month. Zipcar’s growing popularity evidenced by its IPO and already large customer base is a testament to the importance of subscription services. As many software companies move their offerings to the cloud and to subscriptions and many other companies like Zipcar apply the subscription business model, we are witnessing an important inflection point in business and in the way we live. As businesses and individuals discover the benefits of subscription services many will see that they have more discretionary cash available because they have smaller monthly payments. Cash availability drives spending power, which may likely drive demand and create a virtuous circle that drives the economy. Every recovery has an engine, something that drives demand and spending. Historically, this has meant a product category. The Internet served that purpose at the beginning of this century. I don’t know if a business model change has ever played the same role in a recovery, but the advent of the subscription economy may be playing that role this time.